Our brains are made up of two halves – left and right. The left brain controls serial, detail, analytical, logical types of functions. The right brain is more simultaneous, big picture, emotional, artistic, creative, spiritual in orientation. 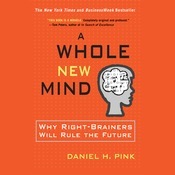 Most of our world: education, business, culture has been traditionally left-brain oriented. The SAT is left-brained, business analysis for decision making is left-brained, the drive to efficiently succeed materially has been largely left-brained. However, as a result of our left-brained drive for efficiency, we continually automate as much as possible, we look for ways to drive cost down so that we reach greater markets enabling products that most everyone can afford. To do this, we cut cost everywhere we can which includes outsourcing as much as possible to workers oversees where labor is much less expensive. These trends: abundance, Asia, and automation are driving a fundamental shift from near 100% left-brain focus to the need for androgynous minds that effectively use right-brain and left-brain skills. Why? Well, what do you give to the person who has everything? If function is equal among plentiful brands, products are differentiated by design and other factors. While computers can automated the serial, logical, analytical functions of the left brain, and are increasingly, they are incapable of automating the simultaneous, big-picture, synergistic and spiritual aspects of humans. And while knowledge is more ubiquitous thanks to the internet/technology and knowledge work can easily be farmed out to others who can do it for less, this is not true of the creative work that relies more heavily of the specific attributes of the designer. When she was alive, my grandmother had quite a disdain for computers and how they replaced jobs done previously by men in the refineries of Port Arthur, TX. Though empathetic about the lost work for men, my historical and practical view saw this no different then the industrial revolution transition that took men from the farms to work. These men could and should have retrained themselves and knowledge work with computers was likely better for them than the work they were doing. Replacing caustic fumes of refineries for carpal tunnel syndrome with computers. But now, here we are in my age at the place where my generation’s work is being replaced by automation and outsourcing. Can someone oversees do it cheaper? Can computers do it faster? Are you doing something that satisfies the non-material, transcendent desires of and abundant age? I was very impressed with this book – more so than any I’ve read in a long time – and consider it essential reading and exercise. I highly, highly recommend it for everyone. Besides a book to read, it is a life study that can be very enriching and you can bet I will be blogging on my experience with many of the exercises from this book. Plus, its a great deal. It’s $17.47 as an audio book from audible.com but it was $4.95 on iTunes. You can get the book in paperback for $12 online at Barnes and Nobel or $9.99 as an eBook. The CD version at B&N is $15.99 online. Seriously, buy this book and read it – especially if your work is heavily steeped in the left-brain functions like the high-tech world. Also, if you’re a parent, realize that our schools have been increasingly centered in left-brain thinking. Programs in the arts have been cut, scaled back, minimized. Meaning has been stripped as a topic in the name of separation of church and state. Your children will not develop or learn about many of these skills in school yet they will be the difference between success and mediocrity or even failure in their age. Supplement!! And try to overcome the sensation that your education and culture put on you – that this soft, artsy stuff is not relevant. Even heavily science-oriented and technical roles such as doctors and lawyers are being transformed by this shift and your children will need to develop these skills somewhere. Support it at the schools and supplement beyond them.